Marcel Carne’s Le Jour se lève is now restored to its full gorgeous cinematic glory in 4K and released uncut for the very first time, just in time for its 75th anniversary. What a time to be alive! A time where films made 75 years ago, whose badly stored original negatives are left to go mouldy in a dank dark facility, can be restored to a breathtakingly high standard. Not only that, but they can be restored in a way that includes previously censored scenes, allowing the film to be viewed exactly how the director intended. Le Jour se lève (also known as Daybreak) is one of the first of the poetic realism movement that came out of France in the late 1930’s to early 1940’s, and has been restored courtesy of Studiocanal and ICO. From 3 October 2014, you will be able to see this classic movie in all of its glorious never-before-seen uncut 4k quality in cinemas across the country. We have been lucky enough to secure a preview copy of the DVD (due to be released along with a blu-ray copy on 27 October 2014) and are very relieved to reveal that it is every bit as good as we hoped it would be. If one thinks of the influential European directors of the era, from the end of the silent era and the progression to talkies, a few names immediately spring to mind; Fritz Lang, Jean Renoir, Carl Theodor Dreyer and so on. Young French film makers of the time in particular were heavily influenced by the surrealist movement of the 1920’s, and director Michael Carné and screenwriter Jacques Prévert were no exception. Adding depth and complexity to their productions in layers beyond what is immediately apparent on the surface, the idea that there’s more to interpret than just what you see with your eyes is something that these directors are highly regarded for. 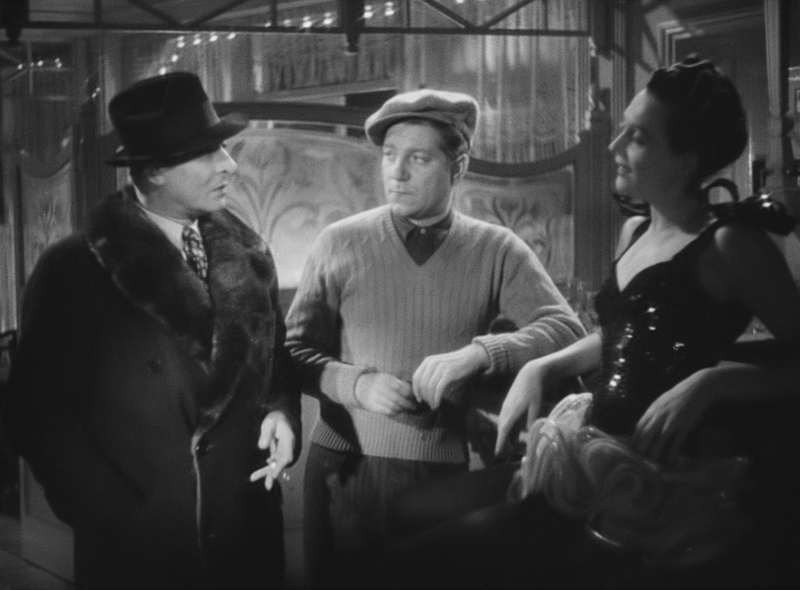 Beginning with the sound of a gun and a man stumbling out of an apartment clutching his abdomen, dying as he tumbles down the stairwell, the real innovation of Daybreak is the way it uses three flashback sequences to tell the story of murderer François, played emphatically by the charismatic Jean Gabin. Trapped in his room with no escape, surrounded by police, it’s during these flashbacks that we learn how our honest working class labourer (the closest thing Daybreak has to a hero) falls in love with Françoise (who he shares a lot in common with), associates with the less naive Clara (Arletty), meets and is corrupted by Valentin (Jules Berry) and eventually commits this heinous crime. The complex non-linear structure of films, from Quentin Tarantino’s Pulp Fiction to Lee Chang-dong’s Peppermint Candy, is only really given any credit these days if it’s something truly exceptional. It’s almost taken for granted in today’s cinema, but was so uncommon back then that a title card actually appears at the start to explain what is happening. However, the technique used by Carné feels as fresh today as it would’ve done back in 1939. It’s used so well that it doesn’t feel gimmicky or tacky, as can sometimes be the case. It isn’t difficult to understand how he became such an influential director when he can pull off something as accomplished as Daybreak with his first try at this style. Influence that has deemed him worthy of being subsequently dubbed one of the leaders of the poetic realism trend. It wasn’t really until the 1960’s when the nouveau / avant garde French film makers such as Jean-Luc Goddard really gave the country its modern cinematic identity. Films where the point was to capture a real, naturalistic version of life. Prior to that, about 20 years before À bout de souffle, French cinema was defined by the way it captured a subtle yet acute manufactured realism. There was no guerilla film making here. Instead, it was just elaborate and meticulously crafted sets, from the inside rooms to the outside streets of the apartment block, alongside a staggeringly impressive use of lighting clearly taking its influence from the German expressionist films that Carné would’ve seen at an impressionable age. Being a DOP on one of his productions would’ve been both a privilege and, I can imagine, a huge pain the arse as his attention to detail puts even John Ford to shame. A lot of cinephiles will have already seen this, though. You may be reading this, fully aware of how talented the cast and crew were, of how great the pre-Noir story is and just how significant and influential it was, but wondering, “what is actually different about this 75th anniversary restoration?” Well, as mentioned, it does include scenes previously censored by the Vichy government. Two of which carry very strong anti-police and anti-authority overtones. A bleak inevitability and crushed-optimism dominates the atmosphere that hangs over Le Jour se lève from its opening to its closing scenes – which is no surprise when you add some context to the time it was made. Whilst this was being made, the socialist supporters of the Popular Front were being crushed by the rising facism, very soon to rip France to shreds in what would become the second World War. Reinserting these particular scenes, satirising the state of the police force and current socio-economic climate, it drives home its point far more forcefully than is apparent in its original theatrical cut. A point which would have still been as prevalent, but less biting and powerful, perhaps. If you decide to wait for the blu-ray/DVD release rather than see it in cinema this Friday, then I highly recommend the “Last Assault on the Popular Front” documentary in the extras to give a bit of additional context. It’s a fascinating insight into those who worked with, studied or knew Carné, Prévert and/or Jaques Viot. Although, at one and a half hours long, some of the interviews on it do seem a tad aimless and even tedious occasionally. But it is informative, as is the 10-15 minute long extra that highlights the restoration process. It’s a nice little treat that perfectly compliments this wonderful, classic and iconic movie. Back in cinemas on 3 October 2014, available to own on Blu-Ray and DVD from 27 October 2014, the team will review Le Jour se lève on the next podcast. Comment below or contact us on Twitter at @FailedCritics to share your thoughts!